The Southern Circuit parks are less visited and more remote but equally appealing for a safari, especially if you prefer to get away from the tourist crowds. The parks include Ruaha National Park, Selous Game Reserve, Mikumi National Park and Udzungwa Mountains National Park. The Selous Game Reserve is one of the largest faunal reserves of the world, located in the south of Tanzania. It was named after Englishman Sir Frederick Selous, a famous big game hunter and early conservationist, who died at Beho Beho in this territory in 1917 while fighting against the Germans during World War I. The Selous was designated a UNESCO World Heritage Site in 1982 due to the diversity of its wildlife and undisturbed nature. The reserve covers a total area of 54,600 km² and has additional buffer zones. Within the reserve no permanent human habitation or permanent structures are permitted. All (human) entry and exit is carefully controlled by the Wildlife Division of the Tanzanian Ministry of Natural Resources and Tourism. Some of the typical animals of the savanna (e.g. elephants, black rhinos, hippopotamus, lions, East African Wild Dogs, cheetahs, buffaloes, Maasai giraffes and crocodiles) can be found in this park in larger numbers than in any other African game reserve or national park. Ruaha National Park is the largest national park in Tanzania. 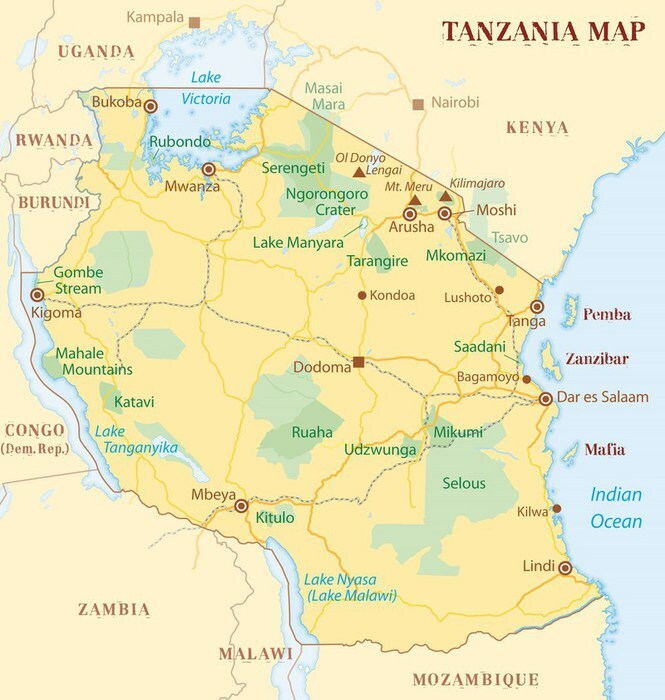 The addition of the Usangu Game Reserve and other important wetlands to the park in 2008 increased its size to about 20,226 km², making it the largest park in Tanzania and East Africa. The name of the park is derived from the Great Ruaha River, which flows along its southeastern margin and is the focus for game-viewing. The park can be reached by vehicle on a dirt road from Iringa and there are two airstrips – Msembe airstrip at Msembe (park headquarters), and Jongomeru Airstrip, near the Jongomeru Ranger Post. The Mikumi National Park near Morogoro, Tanzania, was established in 1964. It covers an area of 3230 km² hence is the 5th largest in the country. The park is crossed by Tanzania’s A-7 highway. The Mikumi is bordered to the south with the Selous Game Reserve, the two areas forming a unique ecosystem. Two other natural areas bordering the national park are the Udzungwa Mountains and Uluguru Mountains. The fauna includes many species characteristic of the African savannah. According to local guides at Mikumi, chances of seeing a tree-climbing lion is larger here than in Manyara (famous for being one of the few places where the lions exhibit this behavior). The park contains a subspecies of giraffe, that biologists consider the link between the Maasai giraffe and the reticulated or Somali giraffe. Other animals in the park are elephants, zebras, impala, eland, kudu, black antelope, baboons, wildebeests and buffaloes. At about 5 km from the north of the park, there are two artificial pools inhabited by hippos. More than 400 different species of birds also inhabit the park. Udzungwa Mountains National Park is a national park in Tanzania with a size of 1,990 km². The habitats contained within the national park include tropical rainforest, mountain forest, miombo woodland, grassland and steppe. There is a vertical height range of 250–2,576 m (the peak of Lohomero), which incorporates the Udzungwa Mountains as part of the Eastern Arc Mountains. There are more than 400 bird species, 2500 plant species (25% of which are endemics) and 6 primate species. It has the second largest biodiversity of a national park in Africa. Six primate species have been recorded, five of which are endemic. The Iringa red colobus and Sanje crested mangabey are only found in the Udzungwa Mountains National Park, the mangabey species was undetected by biologists prior to 1979. Tourism in the Udzungwa Mountains national park revolves around hiking and trekking, as the park has no roads and is accessible only on foot. The hiking trails range in difficulty from the short one-hour Sonjo trek to the extremely challenging 6-day camping trek the Lumemo Trail. The most common walk is the Sanje Waterfalls trail which takes approximately four hours to complete and allows the visitor access to the stunning 170 m waterfall and includes swimming in the waterfall plunge pools as part of the activity.